I've been spending a bit of time in the kitchen lately. With a family my size, it's best to start early preparations for those feasts we plan to share. 101. When was the last time you went to the doctor? Do you like your doctor? I saw my about 10 days ago. No, I don't really care for any of the Dr's I've seen in my small town yet. I'm hoping as I get to know some of them that that will change...but I doubt it. 201. My back is itching, will you scratch it for me? Umm, no. I'll be happy to pass you the back scratcher or point you to the best doorway for the job though! 301. Do you have nice handwriting? I don't care for it, no. 401. We are sending you to either New Zealand or Canada, which one do you choose? New Zealand...I'm already in Canada. Unless you want to send me to Whitehorse next summer to attend my Uncle's wedding, then I'm all game! 501. Do you sing in the shower? 601. Have you ever been streaking? If so, how far did you streak and did anyone see you? Yes, across a football field at night...in the snow. I dunno if anyone saw me. 701. How soon is too soon for Christmas decorations and music playing in the stores? The beginning of November. I don't wanna hear that stuff until December. 801. If you celebrated Halloween as a kid what was the costume you wore at 5? F-if I can remember. Mom...help me out here! 901. How many cavities have you had in your life? 1001. Berleen and Bud come to Arizona to visit Kimber. Who do you think will decide it's too hot here first? 1101. Who do you think will ask TT questions next week? All 3 of you should ask 2 questions each! I don't know if I've mentioned this, but starting late next month, I'll be teaching a sewing class in the itty bitty town that I live in. I'll be teaching folks (up to 6 in the class total) how to make their own Re-Usable shopping bags out of whatever they choose to bring. There's an open house tomorrow at the center where I'll be teaching at, and they've asked me to bring some bags that I can leave there as demonstrations to promote my class. I'll be promoting for about an hour tomorrow after I get off of work, and I'm kind of nervous. I whipped these up tonight. 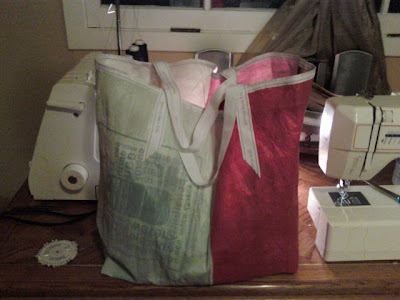 I've been waiting for ages to try out fusing plastic bags together (remember this post?) to use in a project. This provided exactly what I needed. I snagged some bags from Gramma's immense collection, her parchment paper, and got down to business. These are the fabulous finished products I've come up with. While I'm still working on what feels most comfortable to fuse the bags together, and which ones I want to use, I really enjoyed this. The first entire bag is recycled material. Plastic bags, a Pottery Barn ribbon, and an adjustable waist elastic tab from a pair of jeans I bought a year or so ago for H. The only thing that wasn't recycled was the thread. 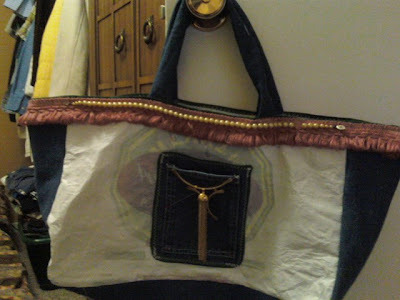 The second bag is a combination of fused plastic bags, some denim I had laying around, a pink length of upholstery decoration, some costume jewelry and green binding. I'll be trying different projects out for this technique in the future, these were just to get the ball rolling. I'm rather pleased with how these projects turned out, and I hope everyone who comes to the Open House tomorrow is as excited about this upcoming project as I am. I hope I get a full class, it would be extremely flattering, I think. It feels good to be creative. Well, life is back to normal round here, barely. I've shipped off H again to mom's house in Kelowna...until the end of the month. It's too difficult for me to cope with both boys after coming home. I can't expect my Mr to do everything all the time either, as my mental health has an effect on his mental health. We both really just need a break from constant demands. D is back in school, enjoys his classmates and teacher, but is angry at us because we won't let him walk or ride his bike to school on his own yet. We saw a bear across the street over the weekend, can ya blame us?! I'm back at work, after a two week nap. I slept a lot, and made a permanent imprint on the pallet/bed where I sleep. I've made a Dr's appt for Friday to see if I can score a referral to someone who will do my counseling over the phone so I'm not required to drive 90 minutes one way to the nearest person who will see me on a weekly basis. If that doesn't work out, I can try the Aboriginal approach. If that doesn't work out, I am seriously considering hospitalizing myself. There've been a number of days where I just have not felt right. Days where I know my mood is weird, even for me. Days where I know the thoughts in my head are not from anyplace near rational. Some of the thoughts in my head are thoughts I've had before, then on those weird days I get some from left field that have never occurred to me before. Those thoughts are dangerous, and it's all I can do to keep them at bay. Don't even get me started on the dreams I've been having. I'm wondering if working right now is the best thing for me...seriously. How can I expect to take care of anyone else, if I'm not taking proper care of myself first. As I sit back and look at things with this skewed perspective, I wonder how on earth I've ever survived the issues I've been through. It's got to be a testament to my ability to keep on. It's time to stop surviving, and start living. The only way to do that is to stop and fix what's been broken, even if it's by baby steps. One way or the other, it's time to get started on that. Well, am having issues securing ongoing services for myself. It's a headache that I'm just not dealing well with. I'll get round to it and get it sorted out eventually, right now I just don't have the brain power for it. I feel like sleeping a lot of the time, and do so with abandon. I eat when I feel hungry, and drink when I feel thirsty. Outside of those basic things, I'm finding it pretty difficult to function on any normal level. You'd never know it to chat with me though. Other than being a bit spacey, I actually appear quite normal. Darius had his first day of Grade 3 yesterday. They've spent the first two days of school keeping the children in something called "family groups" which doesn't really make any sense to me. Essentially they gave everyone a homeroom and group to spend time with until they know for certain how many students they have enrolled & how big they can expect class sizes to be. Tomorrow, D will find out where his permanent classroom and locker is. We're working on the finer points of walking to school on his own. I'm so anxious over this matter, but I'm sure he'll do me proud. We live two houses down from the school, so I do have the ability to watch him from the edge of our yard from behind the fence if I want. haha. Tonight is the first meeting for the Clearwater Playschool. Mr is the President, and I'm the Secretary. I'm not certain, now that this whole schamozzle has turned up, if we will continue these positions though. Sad. I don't like backing out of things I've willingly volunteered for...but if it's a choice between my sanity and devoting more than I have, I'll be forced to choose my sanity. One day at a time, one journal entry at a time, and one mood at a time. I will work my way through them, if I just slow myself down.